The pretzel dough is mixed in 150 lb. batches. 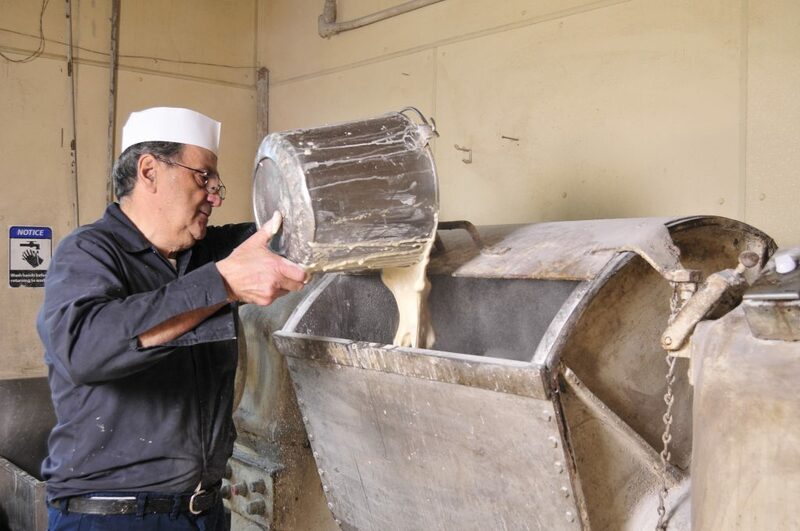 The only ingredients are unbleached flour (from Snavely’s Mill), water, salt, and yeast. 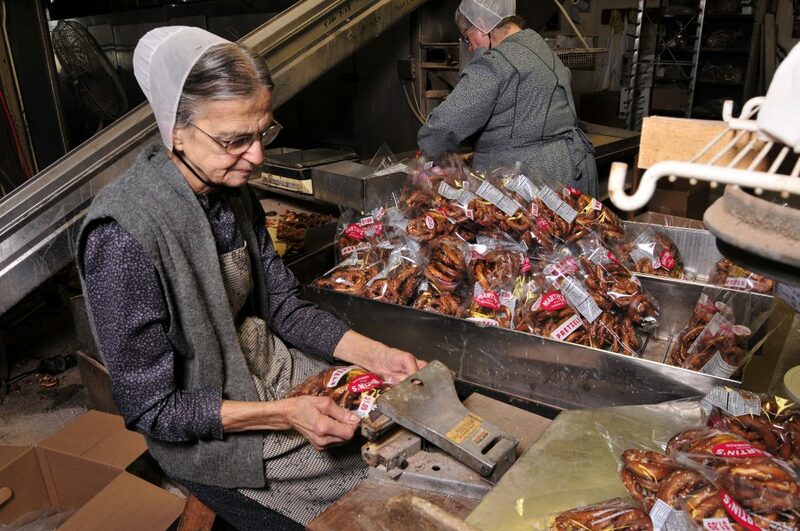 There is no oil or shortening, which is why they are harder than other pretzels. 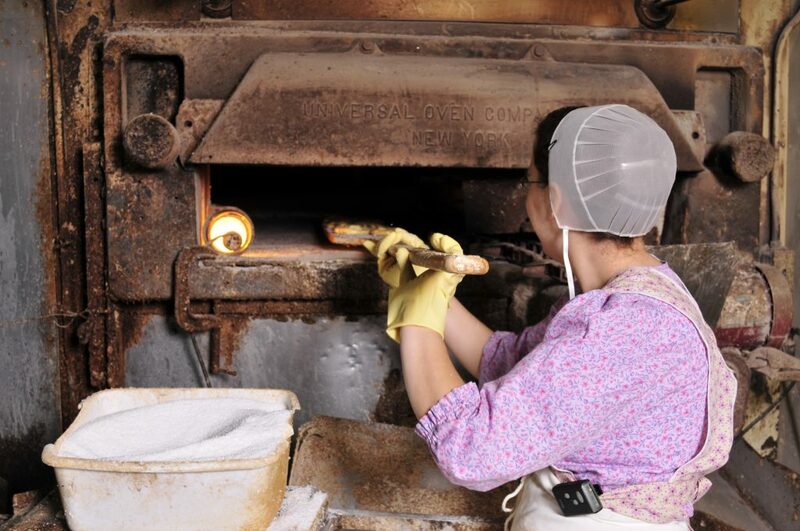 The dough rises for half an hour before it is brought out to the twisting table in a large metal cart. 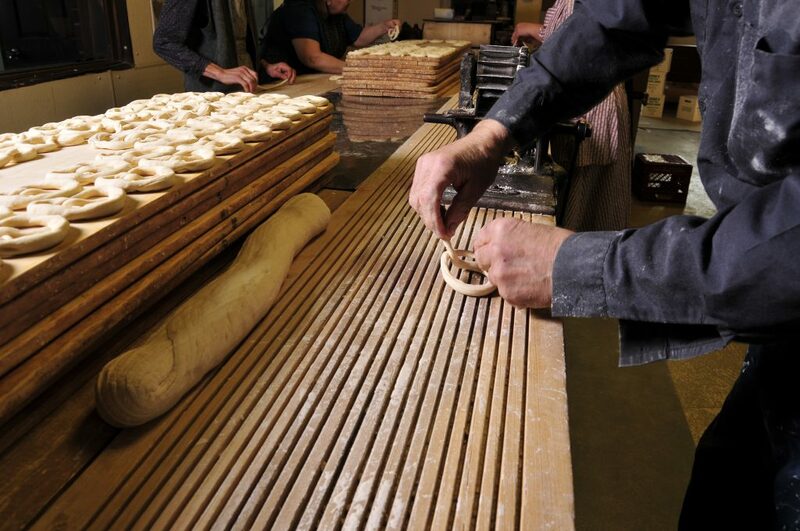 Someone cuts a piece off and kneads it by hand, then shapes it into a round roll that will fit through the cutter. Twelve small pieces fly out of the cutter each time the handle goes around. Each piece will make a pretzel. They are rolled out about 12” long, then you simply pick up the ends and give it a twist. Presto! You have a pretzel! Each employee should be making 10-12 pretzels a minute. Each day we twist appx. 26,000 pretzels, or 1,200 lbs. Ninety pretzels are put on one board. When a board is full, it gets placed on the rack. The rack holds 24 boards. One batch of 150 lbs will fill 1 ½ racks. Once a rack is full, it heads over to the oven. The pretzels rise about half an hour before the are baked. One by one, the boards are taken off the rack and set next to the cooker. 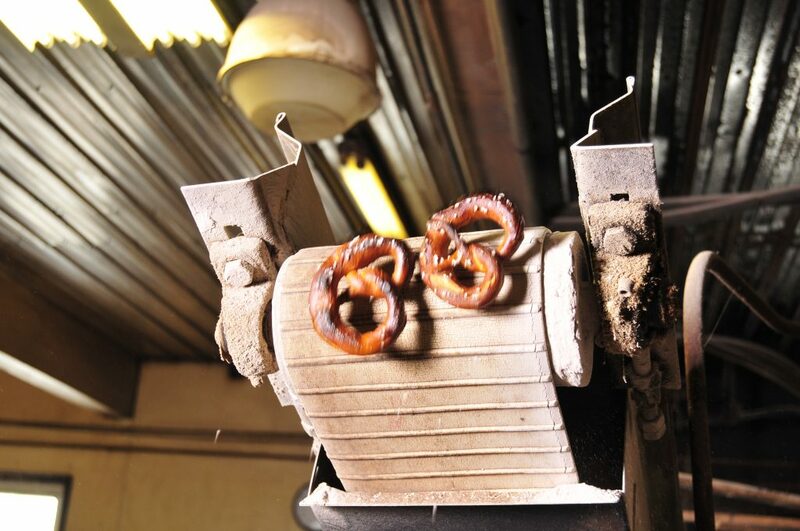 Thirty pretzels at a time are pushed into the cooker, which is full of boiling water with a cup of caustic soda in it. The caustic soda is what gives them their color and flavor. After approximately 20 – 30 seconds, they are lifted out to drain. Salt is placed on the peel (the long board with a handle) and the pretzels are placed on top. The peel is then lifted into the oven and the pretzels are flipped onto the stone table inside. The temperature is 550 degrees. The stone table is going around. In ten minutes, the pretzels return to the starting point and a moving chain brings them down the chute. At this point, they are baked on the outside, but still soft on the inside. An elevator takes them to the top of the dryer and drops them in. The dryer temperature is 180 degrees. This low heat dries out the inside and makes them crisp and crunchy. They slowly travel back to the back of the dryer, drop down a level, and travel front again. This process takes an hour. When they come out of the dryer, they are weighed and packaged in bags or boxes. Now they are ready to be picked up by distributors, who sell them in grocery store or markets within a 50 mile radius and New York City. Or they might be shipped UPS anywhere in the 48 states.